Silvan Selecta from Silvan Australia has added adjustable single-sided and double-sided covered booms to its range of spraying accessories. Designed for spray applications, these covered booms are used to manage and control growth under vines, in orchards or any other tree or fence lines. The adjustable covered booms provide a drift reducing, protective shroud that is fitted with a swivel holder so that the nozzle is correctly positioned and the spray is accurately directed at the target. This complements the nozzle choice and the compound or chemical in use and will maximise the efficiency of the application. There is room beneath the shroud to allow the fitting of up to two nozzles, one fixed and one adjustable to facilitate maximum ground coverage. The double or single-sided covered booms are adjustable in width from 1.5 to 3 metres and have an all-up weight of only 18.5kg. The spray rig attachments have a zinc-plated steel framework that uses a spring loaded break away, so that if contact is made with an obstruction such as a post, stake or tree trunk, the complete assembly automatically retracts reducing the risk of damage. 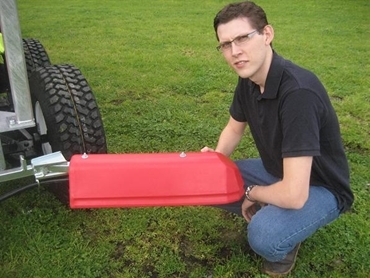 “The covered booms are an ideal attachment for Silvan Selecta spray rigs that are traditionally towed behind a tractor, all terrain bike or similar vehicle to enable the often difficult-to-reach positions in vineyards, orchards and under fence lines to be maintained and managed to reduce weeds or unproductive growth,” says Silvan Selecta spokesman Leigh O’Rielly.